Take one cup of rice and quarter cup of tapioca into a wide plate and spread. Dry the rice tapioca mixture in hot sun for three hours. Take a dry mixie jar and add sufficient quantity of rice-tapioca mixture and grind. Sift the ground rice mixture through a fine sieve and separate flour and rawa. Like this grind the dried rice-tapioca mixture, sift and prepare flour and rawa. With one cup of rice and quarter cup of tapioca we get 125gms of flour and 125gms of rawa. Wash and finely chop green chilies. Crush the chopped chilies in a mortar & pestle. Add some water and crush again to obtain juice. Strain the green chili mixture and extract juice discarding seeds and skin. Heat a pan and add 300ml water and allow it to boil. When water is boiling add salt, green chili juice and rice-tapioca flour. Mix well stirring continuously to avoid lumps. Cook the flour mixture on low flame till thick. Transfer to a plate and spread. Allow the flour mixture to cool. Heat a pan and add 300ml water and allow it to boil. When water is boiling add salt, green chili juice and rice-tapioca rawa. Mix well stirring continuously to avoid lumps. Cook the rawa mixture on low flame till all water is absorbed. Cover the pan with a lid and cook on low flame for two minutes. Remove the lid, mix well and transfer to a plate and spread. Allow the rawa mixture to cool. Spread a plastic sheet in sun. Use a chakli press mould to prepare the vadiyalu. 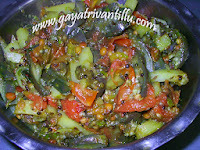 Use a large holed plate in the mould to prepare pindi vadiyalu. Wet your palm and knead the dough. Wetting palm will not allow the dough to stick. Take a portion of the dough and fill the mould. Close the lid and press sev. Spread the sev by moving the hand while pressing the mixture. Like this spread the vadiyalu sev on the plastic sheet. See that the vadiyalu sev is spread in single layer to dry fast. For rawa vadiyalu, use a star shaped nozzle plate in the mould. Wet your palm and knead the rawa dough. Wetting palm will not allow the dough to stick. Take a portion of the dough and fill the mould. Close the lid and press thick sev. Spread the sev by moving the hand while pressing the mixture. Like this spread the vadiyalu sev on the plastic sheet. See that the vadiyalu sev is spread in single layer to dry fast. Dry the vadiyalu in hot sun till crisp. Once the vadiyalu are crisply dried, break them to manageable pieces and store in airtight containers. Spread a paper napkin in a plate. After frying the vadiyalu, place them on the paper napkin to soak excess oil. Heat a pan and add sufficient oil to fry the vadiyalu. When oil is hot drop few dried pindi vadiyalu carefully. After few seconds they puff up in hot oil and float. Then remove them with a slotted ladle and drain excess oil. Spread the fried vadiyalu on the paper nakin to soak excess oil. Similarly fry some more pindi vadiyalu and rawa vadiyalu till crisp and puffy. Serve the crispy vadiyalu with rasm- rice, sambar- rice, kootu- rice etc. The fried vadiyalu serves well as snacks too. Salt and green chilies may be added according to taste. However with less quantity of seasonings, even children can eat them. 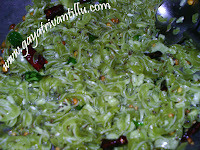 We are adding the juice and discarding the seeds of green chilies in this recipe. This is because—when we fry the vadiyalu in hot oil the seeds may burst and harm you. While frying the vadiyalu, use two slotted ladles, one big and one small. Take the fried vadiyalu with a small slotted ladle into the big slotted ladle and lift from the oil to drain excess oil. When we try to remove the fried vadiyalu from hot oil at one go it will be difficult to collect all of them. By the time we collect them they will be over fried and change color. To get crispy white vadiyalu fry and remove them from hot oil as soon as they puff up. To fasten the process of removing, use two slotted ladles. mi pindi vadiyalu chusanu.. murukulu la vunnai chudataniki... kani yeddalo yekkuva vundalsi vasthundhemo kadhandi? Saggubiyyam and Rice can be put in the sun the previous day and ground into powder. Next day you can prepare the recipe using that flour and ravva. Namaste Aunty. 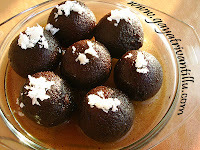 I,Sasidhar, i used to watch ur recipies in net. i am very glad to express my whole hearted thanks for making us masters even we are very poor in "cooking art". i heard that cooking is one of the art of in 64" so please keep ur suggestions and tips for making us happy thank you.